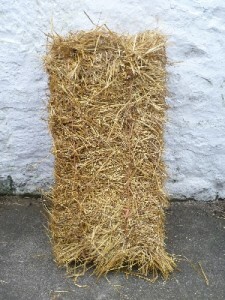 We supply Straw in traditional small square bales typically measuring 1m x 0.45m x 0.35m and weighing approximately 20kg. Typically our straw is either Barley Straw or Oat Straw. It is ideal for use as bedding for horses, ponies, poultry and small animals. It is ideal for using in poultry nest boxes to encourage laying and protect the eggs. Our barley straw also finds application in civil engineering applications around watercourses. Our straw is also ideal for use at parties and the like where an authentic country atmosphere is sought. The bales are available for purchase or hire.